Mindjet's technology provides users with software that helps organisations engage and encourage individuals to collaborate visually, think creatively and save time by capturing, organising and communicating ideas and information in a multi-dimensional mindmap enabling them to manage information, people and projects - all in one place. Individuals and teams can access, update and share knowledge in static and cloud environments, link and layer, lists, data, charts and files in any format - Word, Excel, PowerPoint, PDFs, Web content. Mindjet allows team managers the power to assign action items to team members, highlight key information, set task alerts when tasks are completed or delayed and share maps through the cloud and on iPhone, iPad and Android devices. Companies and individuals around the world use Mindjet's powerful built-in collaboration capabilities to build strategic plans, run effective meetings, hold insightful brainstorming sessions, manage projects and succeed with almost any business or personal productivity challenge. Mindjet, the makers of MindManager, have announced their new Mindjet Subscription package adding more value to organisations' mapping collaboration capabilities. The ‘Mindjet’ solution is now available through a simplified yearly subscription model which provides more tools to the end user and meets with the ever growing demands of business. Collaborative work management: providing the capability to capture and organise ideas, as well as sharing them internally and externally. Subscripton pricing giving customers the ability to predict and budget future software costs. A single licensing solution which includes all applications and services from Mindjet that can be seamlessy utilised across all departments. The new Mindjet 11 for Windows integrates existing mapping, task management tools as well as Cloud and SharePoint collaboration into one solution, now simply called ‘Mindjet’. Mindjet 11 for Windows (formerly MindManager for Windows) - With new functions for planning and budgeting. Mindjet web app (formerly Mindjet Connect) – Core information mapping, online file management and integrated task management. 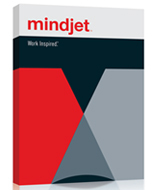 Mindjet on-premise app (formerly Mindjet Connect SP) – A fully integrated SharePoint solution for organisations to create, share and collaborate their mindmaps. Mindjet mobile apps (for Android, iPhone and iPad) – functional mapping apps for mobile and tablet devices. Do you want Mindjet 11 but can't commit to an annual subscription? If the answer is YES then for a limited time you can purchase Mindjet 11 Single Perpetual licenses! Define and track tasks, resources, and deadlines to ensure projects are completed on time. 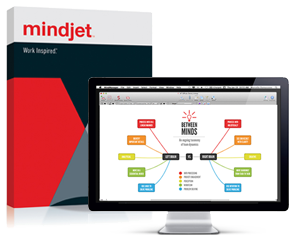 Mindjet is the latest version succesful mindmapping software which is now availble in a subscription model with a host of additional extras. Organisations spend vast amounts of resouces ensuring their staff are collaborting on projects, activities and designs that deliver products or services to market faster. Mindjet fosters active collaboration, enabling users to brainstorm, plan, strategise and present more effectively by using interactive information maps. Mindjet lets users easily import or export to Microsoft Office for quick information capture to quickly transform thoughts, ideas and concepts into fine-tuned documents, compelling presentations and winning strategies. Mindjet web app (formerly Mindjet Connect) � Core information mapping, online file management and integrated task management. 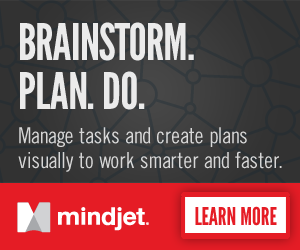 Mindjet on-premise app (formerly Mindjet Connect SP) � A fully integrated SharePoint solution for organisations to create, share and collaborate their mindmaps. Mindjet mobile apps (for Android, iPhone and iPad) � functional mapping apps for mobile and tablet devices. Mindjet Web App is an online service that lets people with shared goals get more done, in the cloud and across devices. In addition to online file sharing, document management and co-editing capabilities, Mindjet Web App provides an intuitive visual framework that helps people brainstorm ideas, solve problems and process information together. Mindjet Web App lets users interactively map out work in progress so that all participants can visualise the process from initial concept to strategy to execution and allows users to make decisions and stay in sync on opportunities, projects and strategies. Easily store, share, manage and access all your files online and from virtually any device. Mindjet On-Premise App enhances Microsoft SharePoint, delivering a powerful solution for collaborative work management. Mindjet On-Premise App (formerly known as Mindjet Connect for SharePoint) is a powerful SharePoint Solution Package that helps teams manage tasks and documents in one visual framework. Mindjet On-Premise App enables your teams to collaborate within embededed maps in SharePoint sites so users can find information, documents and locations quickly. Users can share map content and project tasks whilst leveraging SharePoint infrastructures that ensure security compliance and business process management. With an intuitive visual framework, Mindjet On-Premise App allows users to capture and organise ideas and informationj, encourage problem solving, planning and process information within one visual framework. Mindjet Desktop App for Mac provides intuitive new ways to capture and organise ideas and information. Allows organisations to creatively plan, strategise and interact more effectively helping them work smarter instead of harder, faster and more creative thinking, and achieve more in less time. Organise your thoughts and gain greater clarity.